As you know, I’ve been insanely busy the past weeks, and to make matters worse, the few days off I had were either too cold or my Significant Other wanted to go out for one reason or the other. So I haven’t managed to dress at all; we’ll see if she allows me to have some fun later today! But with a little spare cash in my hands, I immediately “wasted” it into some treats. The first thing to get was a pair of new bras. Why new bras? Well, since I bought my new Amoena breastforms, which required fitting by an attendant, most of my old bras wouldn’t fit any longer. It’s not that the cup size has changed; it’s the way they’re so much fuller, so they require different bra models to look great. And this, like with real women, requires fitting, too. Last week I turned in my dark auburn wig for reconditioning. The shop I go to has the most friendly attendant in the planet, and she’s used to the CD community (pretty much like the Amoena people), so she’s fine with us. Usually this means just dropping the wig there on one day, and pick it up on the next. But for selecting a new wig, like I did earlier this year, I definitely had to wear it, and that was also a new experience for me. Last week I mentioned to the hairdresser that I would like to “revive” my old, human hair wig. My very early pictures from 1997 or so are with that wig, when it was new, lustrous, and very glamourous. Like most human hair wigs (not all, though) it comes with little styling; you’re supposed to style it yourself or get it professionally done. But of course I never dared to do so. The old wig was losing hair and getting way too entangled for my taste, so I thought it would be completely damaged and lost (that’s why nowadays I just buy synthetic fibre; they are getting more and more natural with finer fibre, they keep the style for a long time, and, of course, if you have to throw them away after a year or so, you’re not losing too much money). I mentioned this to the wig shop hairdresser a year ago, and she told me to bring it to see what she could do. She certainly did wonders with it; it looks pretty much as new, very glossy and shiny. But… it was still “raw”, unstyled. I used it just once after the reconditioning, but never again — it didn’t look good enough for me. So the wig was placed in a bag and forgotten. But last week I remembered I still had this wig and mentioned it to the hairdresser: would she style it for me, giving it a more natural look? She obviously said yes, but I had to go there and wear it while she cut it. Another new experience! So we set a date, and yesterday I went to the salon. Since they specialise in wigs for women with hair loss due to radiation treatment, they’re very discreet — you’re alone with the hairdresser behind closed doors, and nobody knows you’re there. It’s also a “safe” environment, and over the years, I’ve managed to become more confident with the hairdresser: after all, she just wants to do her job well and have happy customers. Wearing a wig in front of strangers, and putting on a baby blue bib which pretty much covered my ‘manly’ shape was a strange experience. 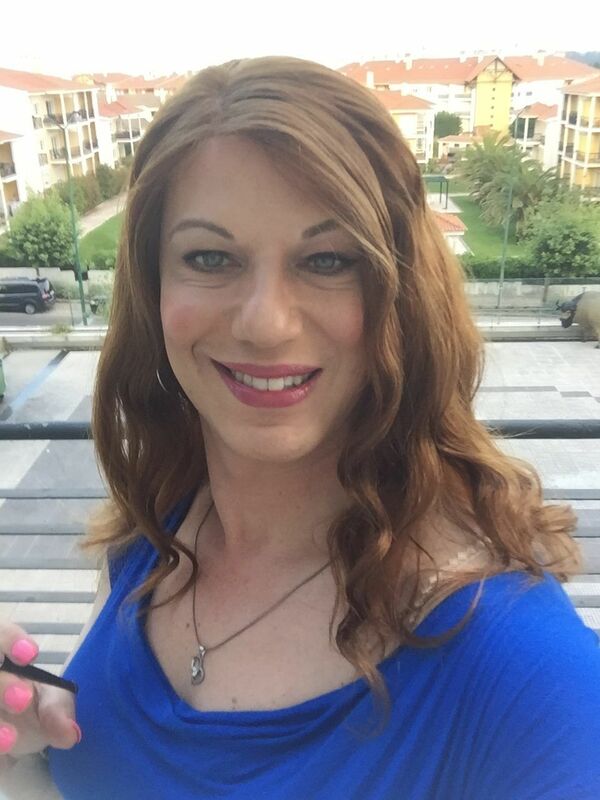 You all know how we crossdressers mentally compensate our own image and look far better in our own eyes than the rest of the world (I think this is the hardest part of “passing” — you always look great to yourself, because you’re enjoying yourself so much!). Still, I felt that the hairdresser was a bit thrown off by my female image — the wig makes a lotof difference! I mean, in my “male mode”, with a receding hairline (not dramatic yet, but it will be in a decade or so), I don’t have an “androgynous” look. Some of the features that I can enhance using makeup are not usually visible: my large eyes, relatively long lashes, very full lips, and a very small Adam’s apple. 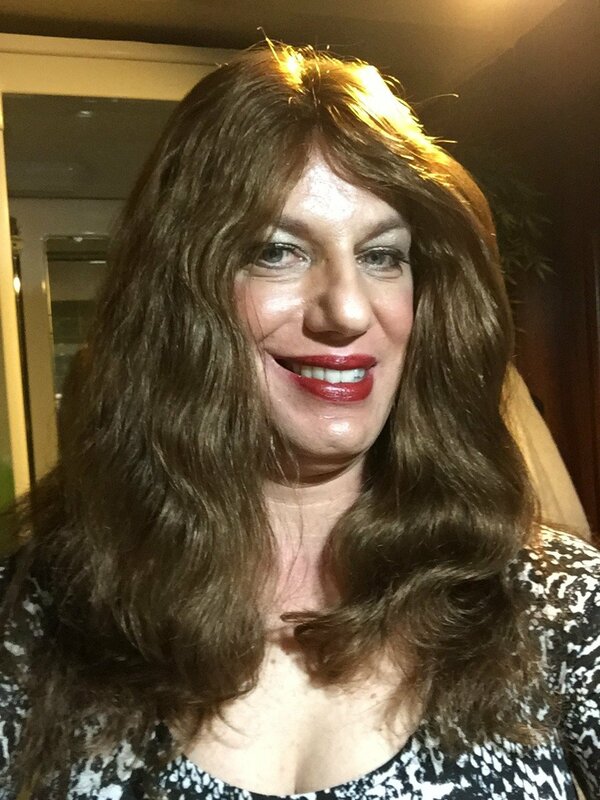 When people look at my face in male mode they just see the big nose and the receding hairline; the more “feminine” features in my face tend to be mentally dismissed. When wearing a wig it’s the other way round. Sure, the huge (and partially crooked) nose will stand out (and that always requires a lot of shadows and highlights) and the jaw line is too hard for a female. Also, I need some foundation to cover the five o’clock beard shadow; even when shaving very closely, this will always be noticeable. And, of course, the eyes and the lashes need a bit of highlighting. But on the other hand, with a wig on, people will focus much more on my full lips and large eyes, and I sensed that the hairdresser was a bit surprised at the overall look. But as a good professional she just did her job and made no comments. She didn’t do a huge restyling; she likes “natural”-looking cuts, not overly elaborate ones, and I tend to agree with her. I hope to show you later how the wig now looks like; I believe that the minimalist approach to just cut where it was essential to do so was enough to make it convincing. This wig also suffers from having a non-anatomical cap, which doesn’t fit so well as the new generation of caps, so I got some “extension clips” sewed in, which will make sure that the wig doesn’t get blown away by the wind (not that I expect to go out in a windy day!). Happy with the results, I was prepared for the next stage. It was now rush hour with an insane traffic jam, and I had a long way to go back home. To make matters worse, it’s Christmas season, everybody is running from their offices to the malls and shops, and, well, it was raining. Put it all together and it spells “insane traffic”. I knew that in advance, so… I had brought with me my breastforms in a bra and my old, battered corset (yes, I bought two new ones from eBay; we’ll see when they arrive, probably by mid-January, along with two new pairs of shoes — and my first pair of boots, yay!). I was wearing an unisex top in dark forest green, which is stretchy, and definitely looks great on top of my full breastforms 🙂 So… inside the car, in a darker corner of the street, I quickly put them on — corset, breastforms, wig — and drove away, right into the traffic jam. My home city, Lisbon, is usually quite well-lighted on almost all streets. But with the rain and condensation inside the car windows, it’s a different story: you simply don’t get many “details” when watching people inside other cars, even if stuck in the traffic. The picture on this blog article shows how I looked like — with a lot of enhancement from Photoshop: in reality, it was much darker than that, even in the best-lighted streets. I was pretty sure that nobody would have spotted me, specially because I wasn’t driving my usual car (but borrowed my father’s car, since my own is in the garage). Cheers all, and Merry Christmas!